The complex sits on a very peaceful two acres of grass land with stunning views of Lake Taupo. For Accommodation in Taupo, Chelmswood Motel Taupo is the perfect choice for the whole family, the couple wanting a romantic peaceful break, the overnight-er looking for a great nights sleep to break their journey, or the club who want all the facilities on one site. Relax in a Private Thermal Mineral Pool or make use of our large grounds and BBQ area. 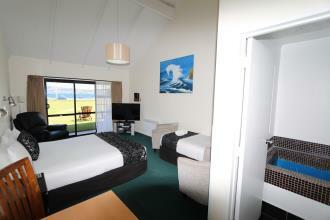 Chelmswood Motel Taupo has all the facilities and services to make your stay enjoyable. Read reviews from happy guests, or write a review for Chelmswood Motel Taupo. Check out the upcoming events around Great Lake Taupo New Zealand. Chelmswood Motel Taupo is a Tudor style complex consisting of 36 units (24) with their very own Genuine Thermal Mineral pools, located at the southern entrance to Taupo with beautiful views of Lake Taupo. One of only 20 properties with 60 Plus Channel SKY Guest Select in Taupo. Easy to find and conveniently located on LAKE TERRACE which passes through Taupo on the way to either Auckland or Wellington. Just 5 minutes from town, with secure off street parking for cars boats, trailers trucks and more. The complex sits on a very peaceful two acres of grass land with stunning views of Lake Taupo. For Accommodation in Taupo, Chelmswood Motel Taupo is the perfect choice for the whole family, the couple wanting a romantic peaceful break, the overnight-er looking for a great nights sleep to break their journey, or the club who want all the facilities on one site including a Function room and Large kitchen. Secure off road parking for your trail bike trailers, race rigs, boats etc. Probably one of the Warmest motels in Town. All rooms have underfloor heating, electric blankets, additional electric heating, outdoor heated freshwater swimming pool 36- 38 degrees, 24 in-room Private GENUINE THERMAL MINERAL Pools, TWO additional THERMAL MINERAL Pools for Hire for the en-suite studio guests use. Plus a LARGE REDWOOD SAUNA Room, so keeping warm is assured. We offer a well equipped laundry for guests use Free, and a generous 1 GB allocation per day of Free Wi-Fi for each individual guest. 10 on site BBQ's and large well equipped grounds.